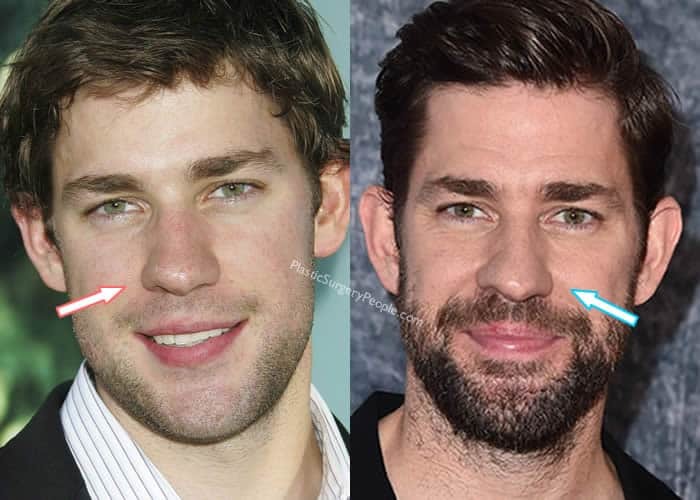 Recently, a number of readers have been emailing our team asking us to do a post on John Krasinski’s nose. 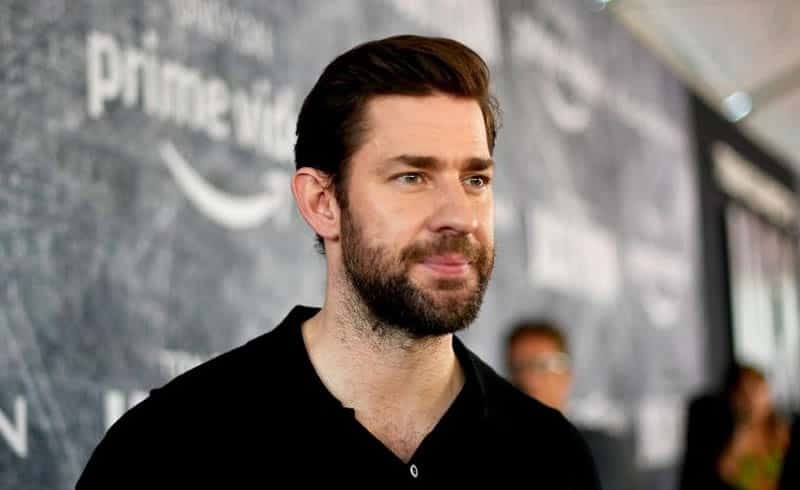 This couldn’t have come at a better time as we’ve been watching his latest TV show, Tom Clancy’s Jack Ryan, and have also wondered whether this distinctive feature of his is indeed real or fake. Let’s be honest here, this guy has a big nose (we are NOT talking about his personality! ), so we’re eager to find out why there’s been so much noise suggesting that the actor has undergone a nose job. It’s not like there’s any dramatic transformation that we could see on his face, right? In saying that, our readers (Yes…YOU!) are the most important people in the world so if there is anything that we can do to satisfy your curiosity, particularly when it comes to celebrity plastic surgery, we’ll be here for you! So, as we have done so many times with numerous celebs. We’re going to break things down and tear his nose apart for you. Only this time, we want to keep things short and focus on his snout only. Let’s get right to it…shall we? How about his young nose? Did John have hair transplant? As you probably know, we love doing before and after comparison photos to proof if a celebrity had undergone a certain cosmetic procedure. We’ll do the same with John Krasinski here. 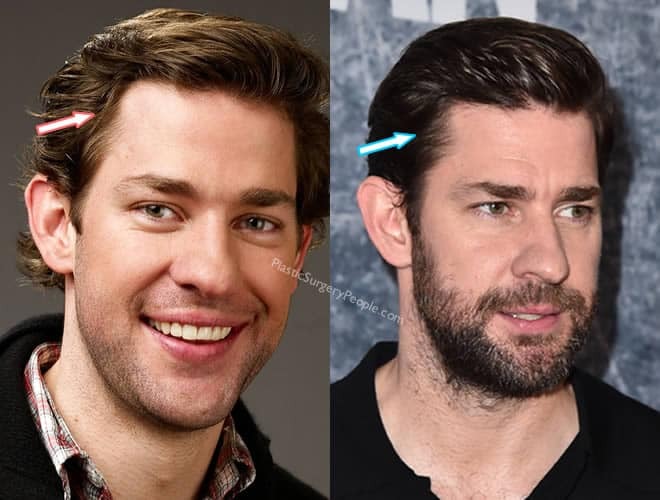 Here we compared John’s nose from the front view. It’s obvious that his nose shape hasn’t changed much over the years. 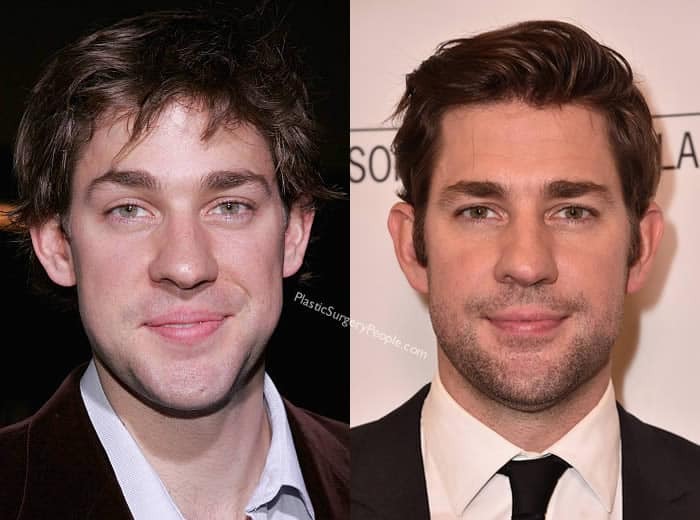 Even though his nasal bridge appears to be thinner than his younger days, but judging from the overall contour, it simply isn’t enough to prove that a rhinoplasty took place. In other words, if this was the work by his plastic surgeon, dare we say it was a complete waste of money! 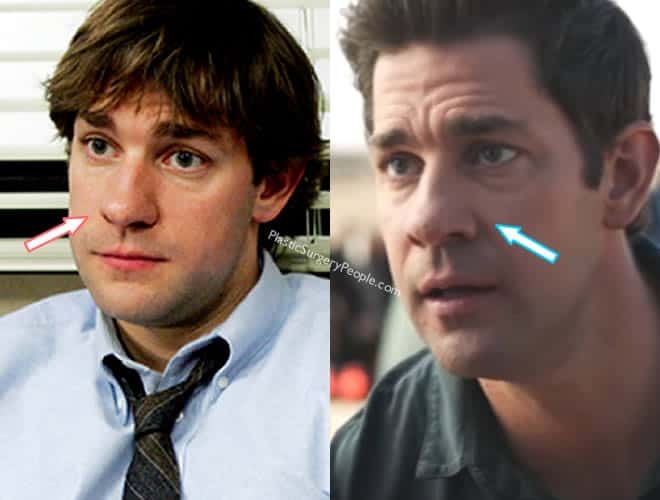 The picture on the top left was taken back in 2005 when John starred in the NBC sitcom “The Office”. From this angle, his bulbous nose had nowhere to hide. Now compare that to the latest 2018 photo (top right), it clearly matched his large nose tip from this same side view. So, nope…no nose job here that we could see! Okay, we know some of you are still not convinced with our analysis that no reconstructive surgery took place. 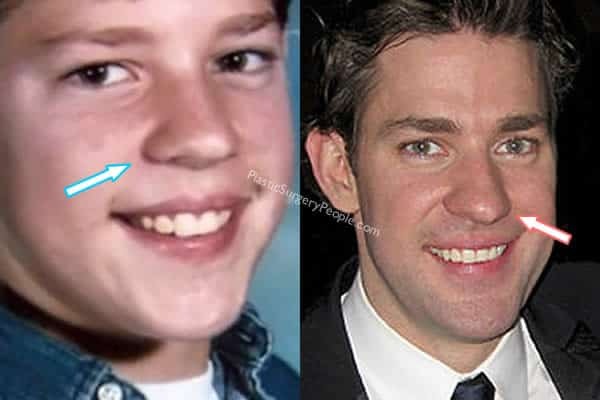 So, we have turned back the clock and show you how John Krasinski’s nose look like when he was young….way before he became famous. Although the photos aren’t very clear, you can tell that his nose structure has remained the same. Does Tom Cruise have nose job? Now that we got his nose out of the way. This is the part where we usually show you the actor’s transformation photos from childhood till now. However, we felt like something was missing. We couldn’t find anything suspicious! 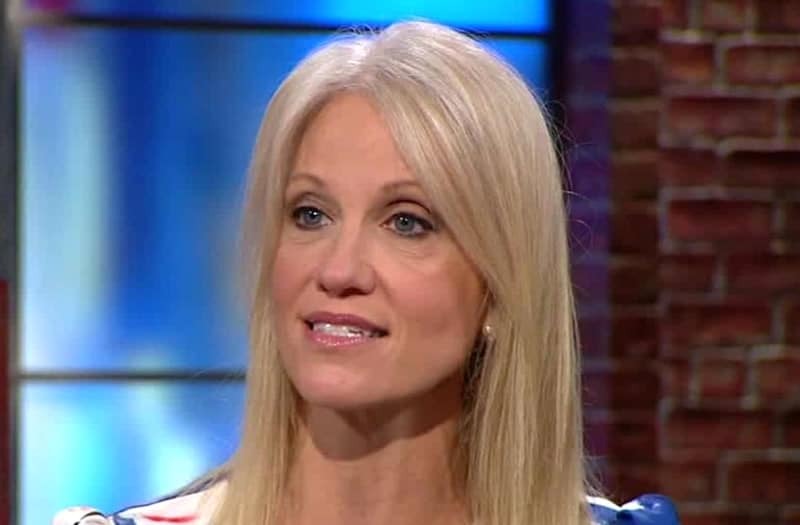 There were no signs of facelift, no chin implant, and not even botox! That’s when we noticed that he may have experienced receding hairline at one stage in his career! Not sure if it’s his hairstyle but is John going through a hair loss here? Looking at the top left photo, you can clearly see that his hairline was higher, especially around the corner. To be fair, he’s not bald or anything and there are men who are far worse than him. Perhaps he caught it early because in the after photo, the hair problem seems to have been corrected. Ray Liotta Plastic Surgery – Facelift, Botox & Hair Transplant? Previous articleDid Mel B (Scary Spice) Have Cosmetic Surgery? Next articleWhat Has Simon Cowell Done To His Face? Did ‘Yoona’ Go Under The Knife To Get Into SNSD?